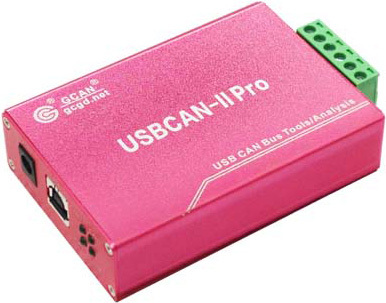 The USBCAN-II Pro by GCAN connects PCs to CAN networks. The product comes with Ecan Windows software tools. The interface module is equipped with SJA1000 CAN stand-controllers and PCA82C251 transceivers. The CAN chips are provided by NXP. The two CAN ports are galvanic isolated (1500 V). The adapter complies with USB 2.0 and USB 1.1. It can be used as a debug or analysis tool with two CAN channel. The product is able to detect automatically the CAN bit-rate. GCAN supplies Windows device driver software as well as software for C++Builder, Delphi, Labview, and other operating systems are supported, too. The offered Ecan tool is able to transmit and receive CAN data frames. Data to be transmitted can be set in two modes—general data transmit and list transmit mode. List transmit mode allows users to edit data list and send it to CAN network. Use this function, users can send multiple data at the same time. 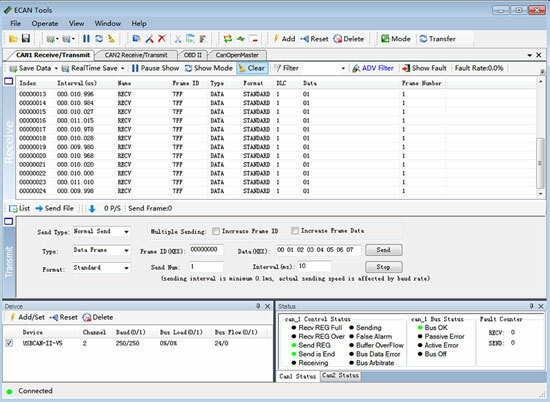 Additionally, the tool features bus analyzing functions. It can be triggered on error frames and arbitration lost. The CAN status display indicates the state of the CAN controller (error active or passive, etc.). The tool is able to detect Fifo overflow situations. It also reports alarms on error conditions and indicates the value of the CAN error counters. With the CAN relay function the user can connect two CAN segments no matter if they have the same bit-rate. The data flow can be seen on the host computer. This function can be used to see the two nodes of data flow, which data is from which node, it can be used to crack communication protocol between two nodes as well. The offline-mode of the tool enables creating instructions in notepad (.txt) and downloading it later to the adapter. Such instructions include transmit, delay, trigger, and so on. The Ecan tool can set more filters, users only need to set the ID or ID segment, then tools automatically filter out the data you want only. It can also classify the received messages in ID, data value, parameter name, format, and counting the number of each data. This function is suitable for large data systems, engineers can observe and analyze other data after same data is combined. The software tool is able to show the time interval between each data, all the times are according to the real-time stamp from hardware, this time precision can reach 1 µs.